Just Write About It. : Reality Television - So what's the big deal? Reality Television - So what's the big deal? In the recent decade Reality Television as a genre of television programming has been on the uprise. Some of the first shows airing in the mid-1990's began with Survivor and Big Brother. Back then, Big Brother's events actually made news headlines! We becameobsessed and fascinated with how humans act in social situations. MTV even jumped on the band-wagon of the reality-success by diversifying its music orientated channel to an entire reality TV channel. It is MTV we have to thank for The Hills, Laguna Beach, The City and Teen Mom (1,2,3,4..... however many have been aired to date). Don't get me wrong, I was one of those girls who did, and still shamefully will, sit and watch every The Hills episode one after the other, no matter how many times I've seen the episodes. - But why? Why are we so obsessed with so-called 'reality' on our screens? Unlike recent successful UK reality shows Made in Chelsea and The Only Way is Essex, reality television gives the impression to the public viewers that anything is possible. Average people win Britains Got Talent, just take Su-Bo for example. And Big Brother takes those who may otherwise be stranded in a 9-5 job like the rest of the nation and gives them something so powerful - fame. Some are short-lived before the media wrongly invades and destroys their lives, e.g Jade Goody, some go on to present the shows they were brought up watching. winner, which then landed the reality star a contract with Sky's TLC channel for her own reality show; The Charlotte Crosby Experience. In the first season of Geordie Shore we see how Charlotte is a realatable character for most teen girls. Not necessarily in her extreme behaviour but through her heart-ache, her clothing, and images of Crosby and the other house-mates simply doing the dishes which create the idea that someday and one day the viewer could become the star. It provides hope to those who seek fame, and in this generation unfortunately fame seems a more of an achievable and appealing goal (through talent shows and reality shows) than going out and getting a job in today's British economy. "In the 21st century, TV content socializes children more than at any other point in its history. Even though children today have a myriad of media choices, they still watch television an average of 4 1/2 hours a day. If the messages kids see on TV are about young people achieving great success and renown, it's only natural for kids to start wanting this for themselves." -Huffington Post 2012. We are even given the information that the majority of what we are watching is entirely made-up and scripted for our own entertainment purposes. So this so-called 'reality' isn't really reality at all. But we know this, and we're more than aware of this. So what is it which makes us tune in every week, eager to find our whether Jamie and Lucy will finally get together?, whether Binky will finally get rid of Alex and realise her wrongs ?or whether The Only Way is Essex has improved and is actually worth watching (it's still not). Social networks such as Twitter allow us to feel involved with whats going on, contact the cast directly and give us a sense of importance, as though our opinion is actually serving any significance. Reality Television has even become a window for marketing and promotion opportunities to arise. Stating "This programme contains product placement" reveals a whole new world behind the television business. It's all about getting the hooking story-line and the most viewers to make the most money, and how else can they make money once the show is already as successful as it can be? Advertisements. They use the reality-stars are walking advertisements to make the products placed, the must-have statement simply because Joey Essex is wearing it. And where to go when all the advertising deals have been made? 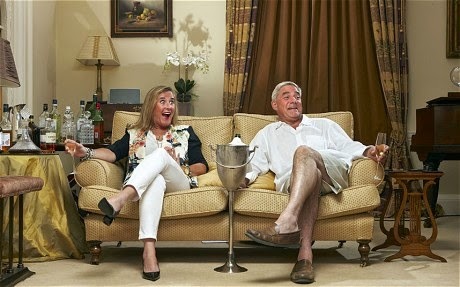 Channel 4 hit the nail on the head with Gogglebox! Of course! Let's creative a surprisingly entertaining programme showing people watching TV and their responses - I've been hooked, it's strangely comedy gold!